Those in the know at Google insist that the company updates its algorithms three times a day on average. Yet despite the frequent alterations – and shrugs from the search engine – SEOs pine for news about major updates. They would undoubtedly adore it if algorithm updates were announced like babies with cards that provided a name, date, size, and weight. The new Google update, spotted earlier this month, wasn’t officially announced but does boast a surprisingly human name: Fred. Are you ready to meet it? Or should I say him? Earlier this month, around March 8, 2017, automated SEO tracking tools revealed significant volatility. The fluctuations indicated that a new Google update had occurred, altering the algorithm and sparking industry chatter. You may have heard both complaining and rejoicing from webmasters around the world. The phantom update appeared to target websites with poor link quality and spam. When the “black hat” SEO community caught wind of the algorithm alteration, they voiced their concerns and frustration. This response made it seem even more likely the update targeted links: “Typically the black hat space is more link focused and when those forums light up, it typically and generally means there was a link quality algorithm update” (source). Lacking specific details, however, SEOs couldn’t wrap their head around the new Google update or formulate a plan of attack. So why do we still knock at Google’s door, begging for answers and a name? What else can we do when we notice something is amiss? From Google’s perspective, the silence is certainly understandable. In withholding this information, Google keeps everyone on their toes. If they announced updates and revealed specific changes, many webmasters would do the bare minimum to ensure their website remained afloat in the rankings. By performing updates in small batches and refusing to confirm most speculation about larger changes, Google encourages all webmasters to continually improve their SEO in order to avoid penalties. I know what you’re thinking: Fred? Doesn’t Google usually name their updates after adorable animals, like pandas, hummingbirds, and penguins? Sometimes less appealing animals have made the cut too, like the possum and pigeon – but Fred? Illyes has stated over and over again that all updates are rolling updates from here forward, not single events. Many people in the SEO community have failed to grasp this concept and continue to badger* Illyes. His tongue-in-cheek christening became permanent when SEOs latched on to the name Fred. Since the naming of the update, it has become abundantly clear that Gary Illyes did not choose the name in earnest. 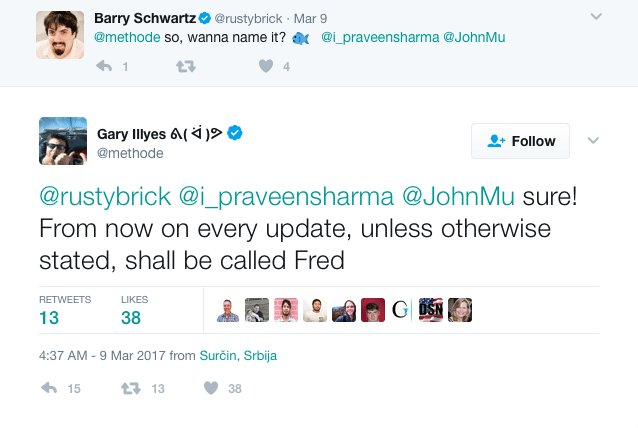 In fact, it seems he names everything without a name Fred. Many websites like this experienced a large drop (typically ranging from 50% to 90%) in organic traffic overnight due to Fred’s wrath. So while Google hasn’t confirmed the update, there isn’t any question that the algorithm was adjusted and took aim at sites laden with ads but lacking valuable content (source). So if your site employs affiliate links, should you immediately remove them to comply with this new Google update? Not necessarily. As Gary Illyes pointed out in the tweet below, the use of affiliate links is not inherently bad form. A problem arises, however, when the ads become the site’s sole purpose. As an example of a site that uses sponsored links well, Illyes mentioned The Points Guy, a website that posts “amazing content” tailored to the user but also includes sponsored links (source). In addition, you might be wondering if you should reduce the number of ads on your website. Google once had a limit of three ads per page, but that was removed in August 2016 (source). These days, the search engine is more focused on the overall balance of content and advertisements, not the total number of ads. While more reasonable (especially when it comes to mobile pages, which sometimes scroll endlessly), this makes it more difficult for webmasters to settle on an acceptable number of ads. Does your site provide value to readers? What is the visual ratio of content to advertisements? Is your content tailored to your users or search engines? Do ads and text weigh down your website? Can you see more than one ad when viewing your site? Are users distracted by the ads on your site? Do users intuitively look to the ads on your site first, not the content? When you write content, do you focus on your readers or keywords? Does your site include any non-text content, like videos? Is any of your content simply useful and lacking a commercial agenda? While many websites rely on advertisements to stay up and running, it is never a good idea to let ads swamp the site. Not only does this scare away readers, but Fred is also not a fan. _____So there you have it: An unacknowledged algorithm update with a name given in jest is cracking down on sites with too many ads and too little valuable content. In the future, as changes (both big and small) constantly roll out, we doubt that Google will deign to announce or name algorithm updates. Instead, we expect to see more Freds: unconfirmed, unexplained updates based on SEO research instead of official reports. 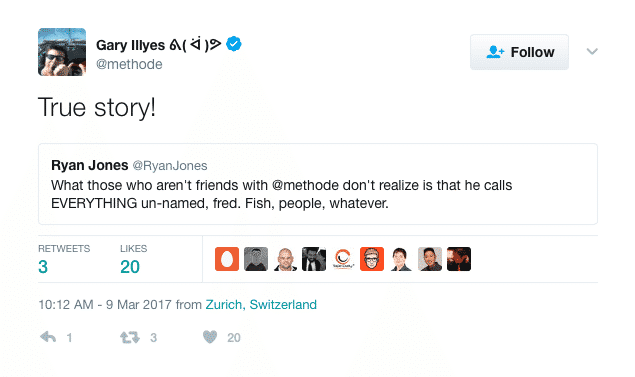 In fact, more than a dozen new Freds have probably already been unleashed! Keep an eye out. *Not a bad name for an update, eh Google?